“Can we do those in spirit?” quipped one participant, to laughs from around the room. 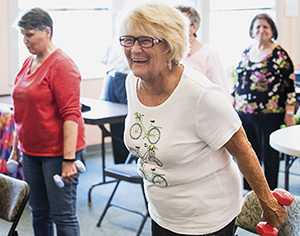 If no one gets a pass when it comes to the chair stand, it’s because Kowaleski knows how important exercise is to maintain the health and independence of older adults. One in four older Americans will suffer from limited mobility, and those who do have substantially higher rates of hospitalizations, institutionalization, and death. The chair stand might seem simple—getting up from a seat without using arms—but it works large muscles essential for walking, balance, and daily functions. It’s also why he was happy to work with the Jean Mayer USDA Human Nutrition Research Center on Aging at Tufts (HNRCA) when it wanted to translate a national clinical study on mobility among at-risk seniors into a community-based senior center. The ENGAGE study focused on enhancing healthy aging with group-based interventions, and by working with Somerville, the researchers extended their lab findings. Mobility, cognitive function, and quality of life all improved among those who exercised in the study. Reid got the idea for ENGAGE after the success of a national clinical trial known as LIFE, short for Lifestyle Interventions and Independence for Elders. To date, the physical activity intervention from LIFE is the “only known lifestyle intervention to conclusively prevent mobility disability among at-risk older adults,” Reid said. The program demonstrated that physical activity reduced mobility-disability by as much as 28 percent in a clinical laboratory setting. The 24-week ENGAGE pilot study included forty adults, ranging in age from 65 to 89, and all with mobility limitations (over half reported falling in the previous six months). 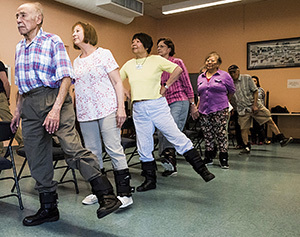 The study used the existing infrastructure of the senior center, including corridors for aerobic walking exercise, and a dining room for balance, strength, and flexibility training. The ENGAGE study extended the benefits of the LIFE study to a real-world population of older adults, said Reid. 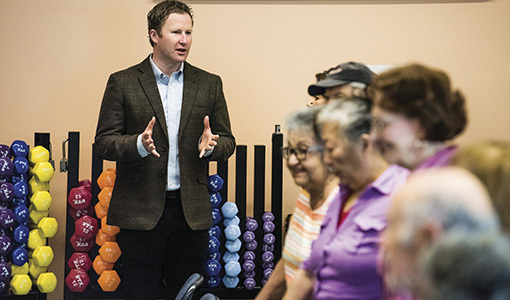 “We found improvements in mobility but also positive benefits on executive cognitive function, quality of life, depressive symptoms, and a reduction in the number of falls.” Looking ahead, Reid sees the Somerville model as a springboard for developing programing at multiple community and senior centers, where existing staff may be able to run it.